St. Scholastica's a cappella vocal group will perform a program of original arrangements of popular songs at 7:30 p.m. Friday, April 21, in the Mitchell Auditorium on campus. 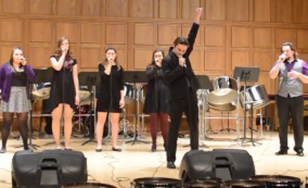 Vocal Revolution's final concert of the year will feature a variety of music genres, including rock, pop, country, soul and more. Acts will range from individual solos to small groups to the entire ensemble. "We're currently working on a medley that everyone will know," said Vocal Revolution director Eric Hagmann, who writes many original arrangements for the group. The group will also perform covers by a cappella acts such as Pentatonix and Boyz II Men.